Customer Listener at Reichardt & Co.
Frans Reichardt loves to help people to listen more closely to each other. He helps organisations to listen more closely to their employees and to their customers. Frans inspires and helps people to improve their listening and communication skills, to understand each other’s needs and to work towards long-term sustainable interpersonal relationships. Reichardt speaks clear language and knows how to get his message across to a wide audience. He presents his message with humour and is not afraid to break taboos. Sometimes he’ll make a fierce tackle, but he always keeps his eye on the ball. Topics he addresses are: • what is the role of sending and receiving in interpersonal communications? • How do we listen? • How do you hear what people really say (and mean)? • Fact or interpretation? • How do you give feedback in a respectful way? • How do you ensure that what you mean is the same as what the other person understands? His interactive performance helps people to work on relationships with a fresh eye and renewed energy. Frans wrote several business books, like Business Bloopers and Meer opens meer clicks (More opens more clicks), and he contributed to books like Anatomie van de Verleiding (‘Anatomy of Temptation’) and Kloteklanten (‘Crappy Customers’). He is currently working on his new book De Klantenluisteraar (‘The Client Listener’). Frans is a member of the Customer Experience Professional Association (CXPA), Toastmasters International and Professional Speakers Association Holland (PSA Holland). 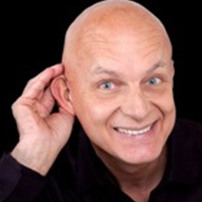 Frans studied Communications and is a Master Practitioner in Neuro-Linguistic Programming (NLP). In recent years, Frans studied the power of listening and the positive effects of listening skills. With his knowledge and experience he helps people and organizations to enhance their listening, communications and presentation skills. Frans gives presentations, workshops, training and personal coaching to employees and executives, managers, teachers and administrators. He speaks Dutch and fluent English.